Muddy Loafers: ANANDIBAI JOSHI – DOCTOR EXTRAORDINAIRE. ANANDIBAI JOSHI – DOCTOR EXTRAORDINAIRE. The Poughkeepsie Rural Cemetery overlooking the Hudson River in the heart of New York is a beautiful place to visit. Great men and women have been laid to rest in this tranquil atmosphere, with its artistically laid out gardens and monuments. Here in Lot 216-A stands an upright rectangular stone adjacent to the plot belonging to an old family – the Carpenters. 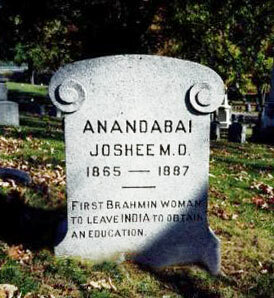 It is simple and devoid of ornamentation, under which is interred the ashes of the first Indian female Hindu doctor, Dr. Anandibai Joshi, who received her medical education abroad. Why her ashes were transported from India to New York, is a story worth telling. Born into a wealthy Brahmin family in Kalyan (near Bombay) on March 31st 1865, this little girl was married off at the age of nine, to a widower who was twenty years her senior. Gopal Rao Joshi was a postal clerk. But he was a progressive thinker who supported widow marriage and the education of women. Her name was promptly changed from Yamuna to Anandibai, and he made it his life’s vocation to educate her. He was transferred from Kalyan to Alibagh to Calcutta. He sent her to mission schools whenever possible, but took it on himself to teach her English. Gopal would take his young wife for long walks during which his teaching sessions continued. He was convinced that learning English was more important than learning Sanskrit. But Anandibai confessed that learning from her husband was not easy. He would hit her with pieces of wood or chairs or books. Later, in her correspondence with him from USA, she had the courage to complain against his tyranny. Anandibai delivered a child at fourteen. The boy lived for only ten days as both of them did not receive proper medical care, because the only doctor available was a Christian. This was the beginning of her ill-health. It made her determined to become a doctor so that she could help other Hindu women. In this, she was fully supported by her husband. Gopal wanted to send her abroad for medical studies, even though they had no money. But here was a woman who believed that whatever the circumstances, nothing or nobody could stand in the way of her achieving her dreams. Her determination coupled with her husband’s encouragement was the first step towards achievement. Gopal wrote to a missionary friend Royal Wilder in the US, asking for help to admit Anandibai to a medical school, and also find a job for himself. The missionary was willing to help on one condition, that they convert to Christianity. This was unacceptable to the couple. However, Wilder was good enough to publish Gopal’s letter in the Princeton Missionary Review. A woman named Theodosia Carpenter was touched by the earnestness of the letter. She offered to accommodate Anandibai when she came to the US. She struck up a correspondence with the girl, and they became good friends through their epistolary exchanges. They discussed Hindu culture and religion. They exchanged views on early marriages and the effect this had on women’s health, of the status of women in society and various other women’s issues. Anandibai’s clarity of thought on such issues was very mature. She was a feminist and believed that she had a right to live and grow and follow her heart. Theodosia brought out the best in her. But Anandibai’s health began to deteriorate. While in Calcutta she suffered from fever, breathlessness and general debility. The medicines that Theodosia sent did not do much good. Gopal however, was determined to send her to USA for her medical studies. Anandibai addressed the opponents in her community about the urgent need for female Hindu doctors. She talked convincingly about her son’s death and her own ill-health because there was no Hindu doctor to care for her. She also promised that she would never convert to Christianity. Her speech made an impact on the community. Donations began to pour in. Even the Viceroy made a donation of two hundred rupees. Anandibai sailed back to India on October 9, 1886, and received a rousing welcome on arrival. She was made physician in charge of the female ward in Albert Edward Hospital, Kohlapur. But her professional life was short lived. Illness claimed her on February 26th, 1887, at the early age of 22. Gopal sent her ashes back to USA to be laid to rest in Theodosia Carpenter’s family plot at the Poughkeepsie Cemetery. I've just read a book on Anandibai Joshi in Marathi, and I was just thrilled while reading the book. The level of maturity she had at such a small age is unbelievable. I googled to see if there's more to know about her, but there isn't. Glad to read this post.